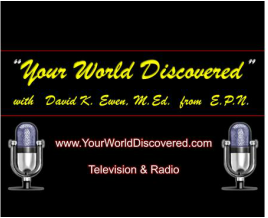 ​Television and Radio Interview - October 5, 2016 - Your World Discovered with David K. Ewen, M.Ed. of E.P.N. Watch the televised version by clicking on blue "Author Interviews" panel or listen to the radio version on the black "Your World Discovered" panel. November 9, 2016 radio interview - "Moving from Writer to Author" - on Your World Discovered with David K. Ewen. Many thank to David Ewen for inviting me back for a followup interview on making the move from a writer to an author. You can listen to the radio interview by clicking on the blue icon to the right.